Hi, my name is Danielle, and I am a peanut butter addict. No really, I am. It’s sad, but I can dominate almost a whole jar in 1-2 days. I may or may not have skipped dinner on occasion to have a ridiculous amount of PB instead! (Busted! If you follow me on myfitnesspal, you know I’m speakin the truth here!) It’s such a love/hate relationship. I love it, and hate that I have no self-control with it! Ha!! Peanut butter often gets a bad rap because it’s high in calories and fat, but it is the GOOD FAT- the fat our bodies need to be healthy. Peanut butter is nutritious and GOOD for you in moderation. (Yes, I am still trying to master that whole concept!) It’s important to note serving size, and I have started to use a TBSP measuring spoon to measure my serving sizes so I can keep track accurately on Myfitnesspal. Otherwise, it’s really easy to overdo it when it comes to PB. (Trust me, I’m an expert on that!) For months I would scoop out a massive spoonful and track it as a “tablespoon”….when in fact it was more like 3! contains fairly high quantities of dietary fiber, amounting to about 8%, which again helps in regulating both blood cholesterol and blood sugar levels. Proteins are present in high amounts (about 24% in weight), together with very important micro-nutrients such as Vitamin E, Vitamin B3 and large amounts of beneficial minerals such as iron, magnesium, potassium, copper and calcium. 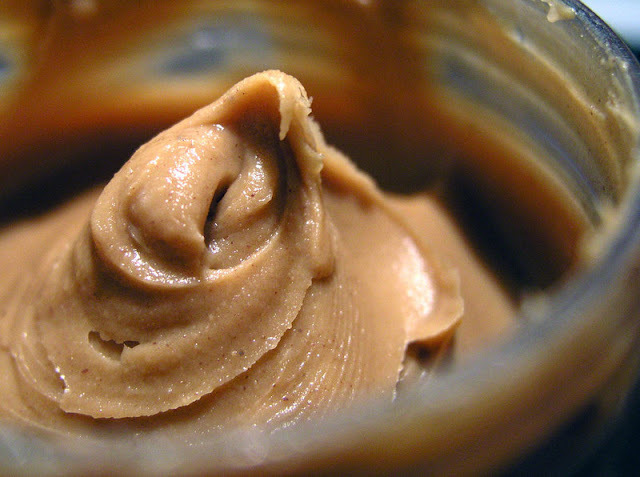 Another fave is Snaclite’s Power Peanut Butter….also delicious! And my NEW fave, which just may save me because it has 85% fewer calories 45 calories in 2 TBSP)…PB2!!! It’s powdered peanut butter and you add water and stir. Sounds weird and I was skeptical too, but my Mama hooked me up with some and it seriously tastes like peanut butter cookie dough!! My new thing is to add it to steel cut oats to give it some flavor & add some protein, all while keeping the calories low! Good, good stuff…I’m LOVIN’ it, but it is expensive. You can get it at Whole Foods or on Amazon…I have put it in my Post-Workout Recovery shakes and I feel like I’m eating a Reese’s peanut butter cup. True story! So, now that you know why peanut butter isn’t as bad as it’s often made out to be, can anyone give me any tips on how to get my addiction under control? I have always heard step 1 is admitting you have a problem…. Haha!! No help here!! I feel like I just wrote this blog......def have the same problem. I don't remember if you have it in GA, but the grocery stores here have giant grinders full of peanuts or almonds and you can literally grind your own butter right there! It's amazing - and i don't even much care for PB. Totally pure raw peantus or almonds. Girl I feel ya on the whole peanut butter addict thing! Totally guilty as charged here too! I have recently switched over to natural pb and it took me a while to get use to it but now like you I can't go back to the "fake stuff" it's just to weird of a taste to me. OH WOW! I am going to get some of this! I have a peanut butter addiction! PB is amazing! I am totally like you- I used to be addicted to Jiff but after tasting REAL pb and almond butter- I can't even stand the taste of Jiff.....so fake and 'greasy'!!! ew!!! I didn't realize you could 'follow people' on myfitnesspal.com! I've tried using it before, but I have a hard time being consistent with it. Following people would be great for accountability! i saw the pb2 at kroger and was going to ry it but asnt sure. i love adding honey to my pb its delish! More Advocare 24 Day Challenge Results! Actions Speak Louder Than Words!!!! My Weight Loss Update…Down 15 LBS!!!! Do you want a SPRAY TAN Machine?? I’ve got mine!! Sunday Social! All About Blogging…. Guest Post: Nikki’s 130 lb WEIGHT LOSS Story! Back to NORMAL LIFE & Dinner with Friends!